I wasn't completely happy with all of the formats of any given locale, so I created my own. 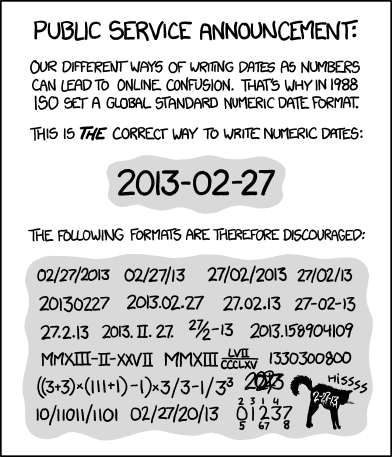 If follows ISO and POSIX standards where applicable. Check the project page for more information. I've been using it for half a year on my main system without any issues. Just in case anyone is using this, I have changed the package name to "locale-en_xx". I just noticed today that it hadn't been uploaded to the AUR because of the upper-case letters in the old name. Oops. (There is now an AUR package for those that don't use my repo). I have also made a slight modification to the '%c' format too. See the changelog on the project page or in the source archive for details. If someone wants to contribute an updated version of the deb package, feel free. If anyone has an XKCD forum account, feel free to mention this locale here. It's indeed a good locale. Thanks! I've been looking for something like this for *years*. I've lately been experimenting with a custom locale myself and had the same problems with urxvt you had in the past. I think I found the reason, why one has to set the LC_CTYPE to en_US.UTF-8. Xlib uses LC_CTYPE as the current locale. See 13.1 here. It also keeps a file (/usr/share/X11/locale/locale.dir) with the locales it supports. It uses this file to determine which locale definitions in /usr/share/X11/locale to use. For most it is simply en_US.UTF-8. So the reason, why it doesn't help, to copy en_US or what ever in your locale definition, is that Xlib doesn't actually care or look at the definitions you made, but only looks at the current value of LC_CTYPE and makes a lookup in its own database. Edit: Fix locale entry see post below as well. Thanks for posting the explanation and solution. I have updated the en_XX README. I just realized, the entry you have to add should have read "en_US.UTF-8/XLC_LOCALE: en_XX.UTF-8". In addition to this entry you also need an entry, that doesn't have the colon i.e. "en_US.UTF-8/XLC_LOCALE en_XX.UTF-8". I haven't used it so far, but for multi-key input sequences to work, you probably have to add entries to /usr/share/X11/locale/compose.dir as well. "en_US.UTF-8/Compose: en_XX.UTF-8", again once with, once without the colon. Sorry about the previous incomplete post... I didn't realize at the time, the difference between the entries. I just thought they were exact duplicates ._. I noticed that the file contained multiple entries with "/XLC_LOCALE" but I assumed they were unnecessary as I thought it worked for you. I'll update the README again. Thanks for taking the time to post a follow-up. Incidentally, there is a missing "-8" in the entry at the end of the first line. It's nice to finally have the solution to this but in the end I think that setting LC_CTYPE to en_US.UTF-8 in /etc/locale.conf the better solution (few files, more "central"). Let me know if you find a way to get people to actually use your locale. I just wish that such a locale would be included in all major linux distributions by default. C/POSIX is just not enough anymore. Any ideas what's the problem and how to fix it? Post the output of 'locale -a' and 'localectl'. If you're going to use LC_*=bar, you have to make sure bar is available i.e. uncomment en_US.UTF-8 locale in /etc/locale.gen and regenerate the locales. Check the output of 'locale -a' to see if en_US.UTF-8 is now available. That solved the problem. Thank you. It's not mentioned in http://xyne.archlinux.ca/projects/locale-en_xx/ , not sure if it needs to be. If you thought that only 'en_XX.UTF-8@POSIX UTF-8' needs to be enabled in /etc/locale.gen then I guess explicitly saying you need 'en_US.UTF-8' wouldn't hurt. I have updated the README. Thanks for the suggestion. I use the alternative way with patches to locale.dir and compose.dir. I have also added an alias for LANG=CUTF, and everything is managed with the following script I run if necessary. echo "Test '$2' in '$3'"
The latest upgrade fixes a longstanding error that led to "unrecognized locale" errors (due to a misunderstanding when I create the locale years ago).